The theme is Healthy Congregations. 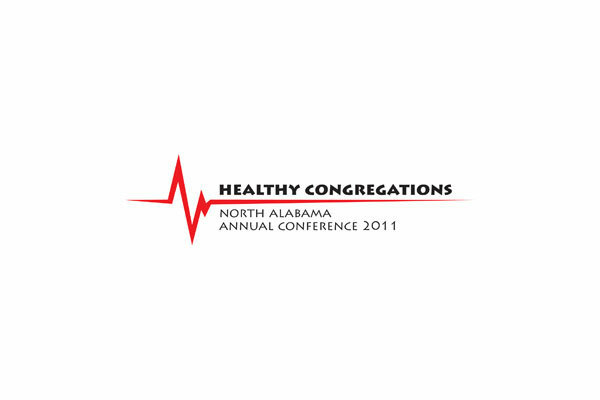 Click here to download your 2011 North Alabama Conference Journal from the online Journal Library. The 2011 North Alabama Conference began on Thursday evening, June 2, at Asbury UMC in Madison with the annual Memorial Service to remember clergy and clergy spouses who have died in the last year. Rev. Reagin Brown preached a sermon titled "Nothing" based on Romans 8:28-39. He reminded those gathered that nothing can separate us from the love of God. He reflected on the thought that even in times of pain we can feel separated from God, yet our relentless God comes in painful moments to do whatever it takes to knock away the separation we feel. He gave thanks for the lives of those being remembered as witnesses to this truth of God’s love throughout their ministries. Rev. William Douglas Wells, Sr.
During the service Bishop William H. Willimon read the name of each person being remembered as a candle was lit in her or his memory. The Wesley Ringers, Piano, Organ and Choir of the host church Asbury UMC provided music during the service. Annual Conference will continue on Friday as the 142nd Session of the North Alabama Conference will be called to order at 9 a.m. The 142nd Session of the North Alabama Conference was called to order at 9 a.m. on Friday morning, June 3. The Conference is meeting at Asbury UMC in Madison. Although it was once the custom for the Annual Conference meeting to move to a different church in different parts of the Conference year to year, the last time the North Alabama Annual Conference met in the Huntsville area was 1953. In 1954 the Conference met at Birmingham-Southern College and the Conference meeting has remained in the Birmingham area until this year. Bishop Will Willimon called the Conference to order and Conference Secretary Rev. Sherill Clontz led in organizing the Conference and establishing the consent agenda. The first report was a celebration of growing more disciples. The Evangelism Team announced the winners of the annual Harry Denman Evangelism Awards. When each winner was announced a short video was shown about that person’s disciple-making ministry. The 2011 Denman Evangelism Award winners are: Robert Riggs (lay), Wannell Scott (lay), and J. David Sherrell (clergy). The opening session drew to a close with an extended time of prayer. Bishop Willimon and Asbury Senior Pastor Rev. Alan Weatherly led the prayer time. Rev. Weatherly explained that prayer is one of the major aspects of the ministry of Asbury UMC and invited Conference members and visitors to participate in this act of prayer. There were two main focuses for the prayer time – 1.) those directly affected by the devastating storms of April 27 and 2.) clergy of the North Alabama Conference who daily are called to be in ministry. As the Asbury praise team led a time of worship storm survivors and clergy were invited to the altar rails, where lay members of Asbury UMC’s prayer ministry were there to pray with each individual. At 10 a.m. Annual Conference members divided into the Lay Orientation Session and Clergy Executive Session. During these sessions each group began taking ballots for General Conference Delegates. Ballots were taken throughout the day on Friday and by the close of the business session the following delegates had been elected. Following the lunch break members gathered backed together and began to conduct Conference business. They adopted the consent agenda. They also elected Sherill Clontz to serve as the Conference Secretary ; Terry McElheny to serve as the Conference Chancellor and Amy DeWitte to serve as the Conference Statistician for terms to expire in 2015. Members then recognized the youth and young adult members of Annual Conference and then heard the Conference Youth report from Amanda Anonio. One highlight of the report was announcing Rev. Clay Farrington is working with the Conference youth ministry team. The Conference then elected Steve Lyles, current Southeast District Lay Leader, to be the new Conference Lay Leader. Adam Neal of the General Board of Global Ministries then thanked North Alabama for the nearly one million dollars churches gave to UMCOR and The Advance last year. The Conference then heard a report from Sumatanga. New Sumatanga Director Matt Johnson reported “God is at work at Sumatanga!” Rev. Paul Messer who has been appointed Camp Pastor at Sumatanga also addressed the Conference. The Bishop also asked for the Conference to observe a Moment of Silence to honor those clergy and clergy spouses who died in the last year and were remembered during the memorial service. Bishop Willimon then declared the clergy appointments fixed. He then welcomed Rev. Alfred T. Day III, pastor of Historic St. George’s UMC in Old City, Philadelphia, who announced that two pieces of American Methodist History will be used in Ordination Service tonight - Frances Asbury Bible & Wesley’s Chalice. After hearing a report from Rod Moss on the ministry of Promise Homes, members were invited to an ice cream break - a gift of Promise Homes of North Alabama. As the Conference reconvened members heard from the new Wesley Foundation Director at the University of Alabama Creighton Alexander and then heard a report from the United Methodist Children’s Home. Rev. Sara Cameron then explained changes Rev. Richard Stryker had made to a resolution he had submitted that he intends to send to the 2012 General Conference. Bishop Willimon then introduced Linda Holland to give the Connectional Ministries report. She discussed the major efforts the Conference and its churches has made in Disaster Response since the April 27 tornadoes. She then introduced Rev. Matt Lacey and Rev. Nancy Cole who discussed the disaster response and the Conference’s commitment to long term recovery from the storms. Bishop Willimon then invited Bishop Robert Fannin to preside over the financial reports. The Conference passed all reports presented by the Council on Finance including the 2012 budget of $9.1 million. This is a 14.97% reduction from 2011. There was an amendment from the floor to add $150,000 to that budget to go to Birmingham-Southern College and Huntingdon College, but the amendment failed. Next the Board of Pension and Health Benefits presented their reports. The most notable report was that Healthflex premiums would see no increase in 2011. Sandy Reynolds explained, the board anticipated a change in the insurance plan in 2013 and has decided to use reserve money to fund differences in 2012. The evening ended with the Service of Ordination at 7:30 p.m. During the service the Conference ordained 17 new elders and 1 deacon in full connection. Bishop Willimon preached a sermon titled “Don’t be afraid” which were words of encouragement to the 18 ordinands. The Conference will continue on Saturday. The 2011 North Alabama Conference came to order on Saturday morning with the Service of Commissioning Provisional Members and Recognition of Licensed Local Pastors. As the business session began Conference members heard the report of Conference Statistician Rev. Lori Carden. They then approved the Committee of Nominations report. The Conference then moved to the New and Renewing Communities of Faith report. Rev. Michael Freeman had requested the report removed from the consent agenda. He spoke of his concern that the North Alabama Conference had not started any primarily African American churches in the Huntsville / Madison area when census reports show there is a growing African-American community here. He also asked for specific actions regarding New and Renewing Communities of Faith including having the General Commission on Race and Religion audit the history of the Conference’s efforts at new church plants. Through the conversation on the floor, it was noted that under the leadership of Congregational Development Director Tommy Gray, the process of planting churches has shifted and has focused on developing leadership and finding new models of successful plants – especial plants that reach more diverse demographics. Rev. Tommy Gray and New and Renewing Communities of Faith Team Chair Rev. Bill Gandy both agreed that North Alabama has much to learn. Rev. Gray said the plan was to announce an African American church plant – with a prepared leader – at the 2012 Annual Conference. He encouraged the church to focus on a new kind of evangelism and be aware that “people need a human being they can have a conversation with about religion.” He encouraged listening and building relationships with those early in a faith journey. Following lunch, the Conference was treated to music by the children who have been participating in the Annual Conference Kids’ Camp. Then members had a time of question and answer with Brian McLaren. The Conference then moved to an order of the day as Bishop Will Willimon introduced the new President of Birmingham-Southern College Gen. Charles “Chuck” C. Krulak. After sharing some of his faith story as to how he was led to seek the presidency at Birmingham-Southern Collge, Gen. Krulak then extended an invitation to the North Alabama Conference to hold its 2012 meeting on the campus of BSC. The invitation was enthusiastically accepted by Conference members. Bishop Willimon and Gen Krulak also recognized the new Chaplain of Birmingham-Southern College Rev. Jack Hinnen. As clergy continued taking ballots to elect their 2012 Southeastern Jurisdictional Delegates, Bishop Willimon invited several groups to share. It was announced that Rev. Joe Elmore and Debbie Wade won the 2011 Branscomb Barrier Breaker Awards given each year by the North Alabama COSROW, Committee on the Status and Role of Women. Nell Berry of the Conference Archives and History also announced a new annual award that group will give each year recognizing outstanding work in local church archives. This year’s winner was Caroline Thompson of Trussville First UMC. Rev. Robin Scott who announced the Annual Pastors Prayer Summit the last week of January each year. Rev. Teddy and Sylvia Crum who will begin serving as United Methodist missionaries in Malawi this summer. Rev. Clay Farrington who is now serving as the Conference Youth Coordinator and announced two upcoming events – Bread and Butter a training for youth workers and the Conference wide Encounter youth retreat. Rev. Alan Weather who announced Asbury UMC’s annual Prayer and Mission Conference.